The United Nations refugee agency implored Jordan on Thursday to open its borders and give temporary shelter to tens of thousands of Syrians fleeing air strikes and fighting in the southwest, Reuters reports. 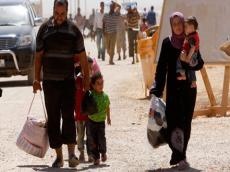 More than 320,000 civilians are now displaced in southwest Syria, living in dire and insecure conditions, including 60,000 at the border crossing with Jordan, U.N. High Commissioner for Refugees Filippo Grandi said. Jordan already hosts some 640,000 registered Syrian refugees.